give a fig | Hail to hot chocolate! I’m just coming down from a delicious high of sipping heaven. This little indulgence will satisfy your soul (and your gut) this holiday season…and sail you right past the winter doldrums. Heat non-dairy beverage over medium-low heat just until nicely warmed (do not bring to boil!). Pour into high-powered blender. 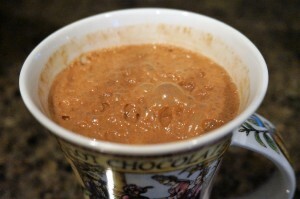 Add cacao powder, cinnamon, coconut oil, and sweetener. 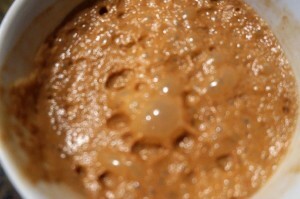 Lid the blender and whirl on high for 20 seconds. Pour into waiting mug. The addition of the coconut oil blended at top speed transforms this brew into a thick, frothy, and smooth chocolate cream. Such decadence! This is nutrition delivered with elegance. 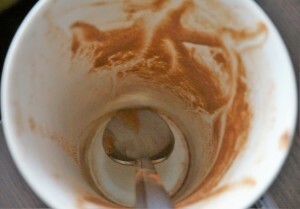 Honestly, you will want to lick the innards of your mug. Nutritional note: raw cacao delivers an array of immune-boosting and heart-healthy antioxidants, magnesium, blood sugar-balancing chromium…anti-bacterial cinnamon further regulates blood sugar and boosts cognitive function…and virgin coconut oil is a wondrous cure-all fat that is anti-bacterial, anti-fungal, balances hormones, feeds the brain, and improves digestion.